Do Honeybees Fly South for the Winter? As a 20-year marketing professional living in the Twin Cities, going to the grocery store used to be all business. I had my list of items to get, but I also made it a habit to take note of product packaging, shelf placement, and displays before heading to the checkout. In 2000, that all changed when my husband and I bought a 172-acre farm and moved 70 miles north to Mora, Minnesota. Here, we established our certified organic farm where we grow apples, plums, and veggies; and we produce maple syrup each spring. I have also joined the incredibly fascinating world of beekeeping. Life for us took a turn in so many ways; going to the grocery store was no exception. Now my grocery shopping is less about market analyses than it is about crossing paths with my neighbors and catching up on local happenings. And, of course, as is the case with small towns, familiarity is widespread, so most everyone knows that I’m a beekeeper. As always happens when anyone takes just a moment to think about these amazing creatures, I saw the wheels cranking and the flood of questions that came to mind as the realization set in… it’s winter in Minnesota. Where are…? Do they…? How can…? What the….? Do you…? Huh?? With his full attention, I perched comfortably on my shopping cart and began to explain. Honeybee colonies are very much alive during the winter in Minnesota. After a busy summer of foraging for pollen and nectar, the bees have amassed a large store of honey and pollen that they set aside specifically for their winter survival. Every colony consists of one queen, the mother of all bees, worker bees (females) and drones (males). In the early fall, the queen will slowly taper off her egg-laying and by late October, she stops laying eggs altogether. By that time, the worker bees, not wanting to share their food, have kicked out all of the non-productive bees – the drones. No room for couch potatoes, and for the next few months, the hive is an all-girls club. When the temperature outside starts to dip below 57°F, inside the hive the bees will begin to cluster together into one large mass with the queen in the middle. They will take turns moving from the center to the outside of the cluster to assure that everyone gets their fair share of warmth. They generate heat by shivering their wings so the temperature within the cluster will remain between 60° - 80°F. By late winter, about mid-February, the queen will start laying eggs again. Once there is brood in the nest, the bees turn up the thermostat in the nursery and will keep the temperature at a constant 92° wherever there is brood, even if the temperature outside is below zero, which is often the case that time of year. The bees do take advantage of those brief winter warm spells – the ones that always seem to undermine the St. Paul Winter Carnival – and will venture outside to (ahem) relieve themselves. At this time, a small population can be seen buzzing around outside of the hives, and upon closer inspection, tiny little brown speckles on the surface of the snow can be seen. Just like humans when we are clustered together during the winter months, indoors is an optimum environment for sharing and spreading sickness. The list of possible diseases, pests, and problems that threaten a colony are too numerous to mention here, but suffice it to say that the challenges are many, and cold weather is a small one in comparison. If the colony can survive the winter, odds are good that it can rebuild itself into a strong hive the following summer. By spring, the population of the hive is significantly reduced. But there only needs to be enough worker bees remaining to help the hive’s population grow as they get ready for the busy summer season and they begin the process all over again. Now back to the grocery store. Just for the heck of it, I explained to Dave the Frozen Foods Guy that one-third of all of the food we eat is a direct result of the honeybee. So technically, my honeybees are his employer, because without them, he wouldn’t have the goods he needs to restock the freezer. With a satisfied nod, Dave acknowledged that he too just became a big fan of one of the tiniest, most astonishing little critters on this planet. As he went back to work, I too reflected back to my days living in the Cities, when grocery shopping was just business as usual – I picked up my essentials, reviewed the competitive marketing strategies, hoped I wouldn’t run into anyone I knew so I could hurry home to consume it all, and never gave a thought about where all that food really came from. Debbie Morrison grew up in Minneapolis and spent more than 20 years as a marketing strategist for ad agencies in the Twin Cities. 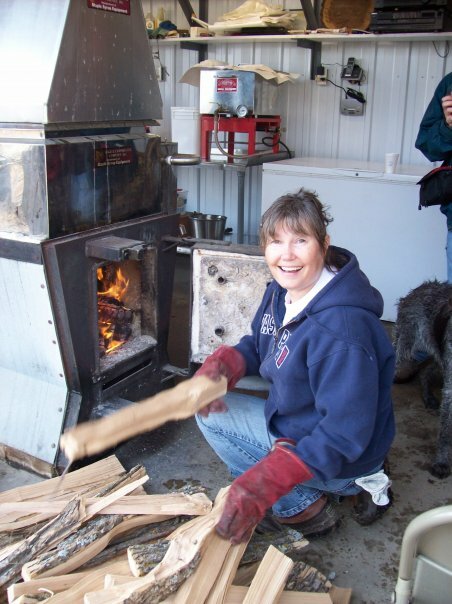 Now, she and her husband own and operate Sapsucker Farms, where their certified organic crops include maple syrup, apples, plums and vegetables. Debbie has been beekeeping for five years and manages 10 to 20 beehives each year.